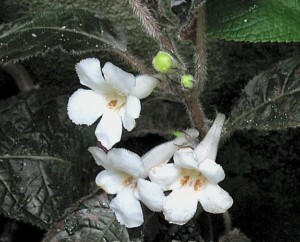 The genus Nautilocalyx was established by Hanstein in an introduction on genera of Gesneriaceae in the New World (1854) but 11 years later, he reduced it to a synonym of Episcia (Hanstein 1865). Bentham (1876) then divided the genus Episcia into six sections including sect. Nautilocalyx. Sprague (1912) resurrected the genus on the basis of the position of the ovules on one or both surfaces of the placenta. However, Wiehler (1978) found Sprague’s character to be inconsistent and variable among some members of Episcieae. A recent molecular phylogeny (Mora & Clark 2016) found that Nautilocalyx as currently defined is not a natural group. Species of Nautilocalyx have been found to belong to different lineages. However, Nautilocalyx needs further taxon sampling before taxonomic changes are proposed. One of the lineages informally known as the “Nautilocalyx sensu stricto clade” contains the type species (N. bracteatus) of the genus. Therefore, all the species in this clade correspond to the “real” Nautilocalyx species. These species are: Nautilocalyx aeneus, N. antioquensis, N. bracteatus, N. biserrulatus, N. colombianus, N. erytranthus, N. lehmanii, N. lucianii, N. urticifolius. Most of the species of Nautilocalyx sensu stricto have funnel- or trumpet-shaped corollas with spreading lobes, narrow lanceolate to linear-lanceolate calyx lobes with the dorsal lobe greatly reduced and recurved to accommodate the gibbosity at the base of the corolla and a corolla tube that is less than 2× longer than the calyx. Most of the species in the Nautilocalyx s.s. clade are distributed in the Chocó biogeographic region in Colombia and Ecuador and the Andes and inter-Andean valleys of Colombia. One exception is N. erytranthus which occurs to the east of the Andes in the Amazon basin of Colombia and northern Ecuador. Another lineage that contains most of the species of “Nautilocalyx” is known as the “Amazonian Nautilocalyx clade”. The species in this clade are obligate terrestrial herbs with similarities to members of the Nautilocalyx s.s. clade such as isophyllous leaves and succulent stems. An important distinction between the Amazon “Nautilocalyx” clade and the Nautilocalyx s.s. clade is that the calyx lobes are overlapping at the base, or folded in a conduplicate manner such that each lobe is appressed to an adjacent lobe and folded lengthwise with the margin curved upward. The calyx lobes are also leaf-like and cover the basal gibbosity of the corolla tube. Most species in this clade have tubular white or cream corollas. The corolla tube is usually 3× or longer than the calyx lobes and is typically longitudinally sulcate with blunt ridges on both the dorsal and ventral surfaces. As its name indicates, most of the species of the “Amazonian Nautilocalyx clade” occur in the Amazon Basin.